In the Bible, Noah does not utter a single word before the flood waters recede. That Noah speaks in this movie, as well as that his wife and daughter-in-law also speak and have names, are extra-Biblical points. But for any storyteller, opening mouths, as well as putting faces and names together, makes sense. Not only that, but their characters are used to help explore important Biblical theology. In our world today, females want to empathize with Biblical stories, so this opens up a huge opportunity for Emma Watson (as Noah’s daughter-in-law) to dive knee-deep into an incredible performance around Biblical themes of barrenness, miraculous healing and a healthy feminine spirit that engages both men and women. Amid impending disaster Noah fights to keep his family focused on the goal: to build an ark in preparation for God to accomplish His purposes. Sure, Noah’s family is a bit younger than the Biblical text (our casting call for 100- to 300-year-olds didn’t cast a wide enough net), but it proved key in this film to create a well-resonating set of characters. He is a father trying to keep his adolescent family focused on God’s mission to act justly, love mercy and walk humbly with God. Young adults will freely connect to Logan Lerman, Douglas Booth and Emma Watson’s characters’ toil as much as I did with their onscreen dad’s toil. In a postmodern world that says never to trust someone over 30, this story has Noah seeking out his loving, wise (and scriptural) grandfather Methuselah to help interpret the vision he is getting from God and how to act upon it. Methuselah also gives the key scriptural explanation for why God is bringing the flood. Listen for it. Some have laughed off Hollywood’s inclusion of a villain by commenting that Noah in the Bible didn’t face an archrival other than “rain.” Probably true in one sense. But Genesis is explicit in saying that every man’s heart was focused on evil all the time and filled with violence. Storytellers put names to concepts. Writers Darren Aronofsky (who also directed) and Ari Handel have done a similarly important thing by creating Ray Winstone’s character as the personification of mankind’s evil: he is spectacularly vile in leading the people against Noah and the ark. Many of the rumors swirling about the film are flat out false (hint: no overpopulation, no global warming). More importantly, missing from the rumors are some really positive values in the film. Throughout, the film explores Noah’s understanding of God’s justice and mercy, held in appropriate tension with one another. It really wrestles with the question “Does Humanity Deserve to be Saved?” It may not use those words, but the important question Noah wrestles with deep in his soul is whether God wouldn’t be better off just cutting bait – letting Noah and his family die off, too — and saving the animals. Of course, Noah isn’t God, and God knows exactly what He’s doing – both in the text and in the film. An active God with a plan will often move in power to make miracles happen. Our God makes known the end from the beginning; His purposes will stand and He will do all that He pleases, including healing the physically broken to bring about His plan. The most foundational, core piece of theology that personally moves me forward when I’m struggling is that we are created for a purpose in the image of God. Noah carries it with him and speaks it. Tubal-Cain speaks a variant on it, too. An overly gushy Hollywood Noah might be tempted to let a flock of “nice” or “good” humans on the boat, or three or four extra cute giraffes that he felt bad for. But this Noah stands strong. His mission is clear: Nobody but his family survives. A story of this magnitude and renown required an equally A-List pedigree of filmmakers and actors: Academy-Award nominated Darren Aronofsky, Academy-Award winner Russell Crowe (“Noah”), Academy-Award winner Sir Anthony Hopkins (“Methuselah”), Academy-Award winner Jennifer Connelly (“Naameh”), Emma Watson (“Ila”), Ray Winstone (“Tubal-Cain”), Logan Lerman (“Ham”) and Douglas Booth (“Shem”). At a time when pop culture conversations tend to focus on entertainment spotlighting superheroes, vampires and zombies, the whole country is abuzz about a story that embraces the themes of Scripture. America has an emerging (and emerged) generation that many polling organizations have found to be increasingly disengaged from faith (as in, disinterested). They’re not arguing about the apologetics we once held dear; they’re just … generally detached. This film is created by secular and Jewish storytellers for a wide audience. It will engage a young, secular audience who will be thinking about the great flood with or without us. If you’re concerned a nonbeliever is going to learn the details of the story wrong, I’d encourage you to reread the list above and start to have beautiful conversations about faith over some popcorn and soda in nonthreatening ways with people you may have never otherwise had the chance. The Gospel alone is good news enough with or without a movie, but when theological questions begin to emerge from inside any person, I would far rather have you and I listening instead of criticizing. Remember, it is the church’s responsibility to spread the Gospel – not Hollywood’s. That Noah tees up a deeper conversation about God and his plan of salvation for us is a considerable blessing. We can have fun, spirited debates of how you’d do it differently if you had $125 million to make your version of Noah’s ark, but let’s focus on the opportunity for now and use it as a springboard for holy conversations. John Snowden has served as the Biblical Consultant on Noah since April 2012. After six years of vocational youth ministry in West Los Angeles, John moved with his family to Kathmandu, Nepal, where he is a Vice President of CloudFactory, a tech company seeking to connect a million people in the developing world to basic computer work while raising them up as leaders to address poverty in their own communities. He is not related to Edward. This story was first published at THE CHRISTIAN POST on February 26, 2014. We have reposted it here with permission. I usually never have any thing negative to say about any of these articles, but wow! Not only did you miss the mark on this one, you weren’t even close.. sure you can dig and dig to find a glimmer of something positive about this movie, but in the end, it just isn’t worth it. I wouldn’t recommend this to any Christian I know, let alone any unbeliever.. 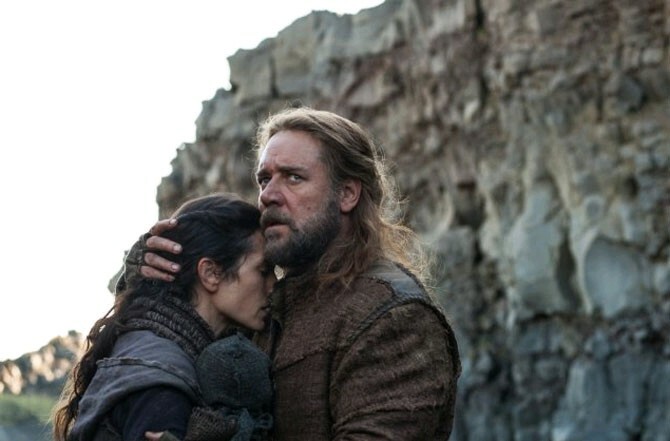 Hate to admit, I was one of “those who felt compelled to criticize” the movie, “Noah,” based on a couple articles & an interview with actor, Russell Crowe, who portrayed the main character in this movie. And no, I haven’t seen the movie. Yet, your article has changed my original opinions as you expressed so profoundly why one SHOULD see “Noah.” You made a lot of sense, Mr. Snowden!! Hee-Hee! Will be sharing this article with my many siblings in Christ, after swallowing my ignorance. Groan~. God’s wonderful blessings be showered upon you, John Snowden, and your family!! I have to say making a movie taken from the bible is a bad idea if your not going to stay on point with the greek and hebrew translation of the Word of God. It’s just another work of man that will be cast into the lake of fire in the end and you know it. I have to agree with Mark and Brian here. I watched the movie and it has nothing to do with the actual story in the bible. For example, when the man who built the boat (supposedly ‘Noah’ from the bible in your film’) described creation to his children, the images contained scenes of evolution. This is not at all Christian and certainly not what the bible teaches. And may I ask, what are those transformer-type beings that helped Noah, the so-called ‘watchers’? Where is reference to that in the bible? Don’t get me wrong, I enjoyed the movie, but it shouldn’t in any way purport to be a story of the bible. Perhaps just describe it as a film about a man who built a boat, with the help of science fiction characters, to escape waters that sprang up from the earth and rained from the sky, in order to keep his family safe. And call him something other than Noah. You could not have missed the mark more Mr. Snowden, you might consider spending more time in the Word, a read thru Genesis will show you, your Noah is not the Noah of the Word.